You will find rue often mentioned in the older herbals, (Rue is first mentioned by Turner in 1562, and was noted by early writers such as Pliny), but the use of Rue as a medicinal herb has declined in modern times due to it's toxicity, and the bitterness of its taste. Rutin is responsible for the bitter taste (7 to 8% in the dried leaves). Rutin is anti-inflammatory, antiviral and antibacterial and helps to protect against free radicals. It has been used to treat varicose veins and has a tradition of improving eyesight.3 Rue is valued as a country simple for its ability to ward off pests and is one of the ingredients in the Vinegar of the Four Thieves, a formula made famous during the plague years in Europe. You can still make good use of rue today as a flea repellent and to discourage slugs and beetles in the garden. 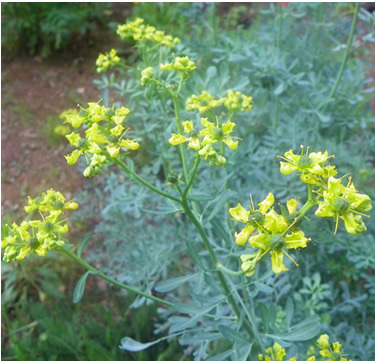 Used in small amounts rue can ease headaches, especially those caused by nervous tension. The leaves can be applied externally in poultice form to relieve sciatica. Preparation Methods & Dosage :Dried leaves can be used in teas, fresh leaves can be used in poultices. Chew a fresh leaf to dispel a headache. Use only very small amounts, and only on occasion. 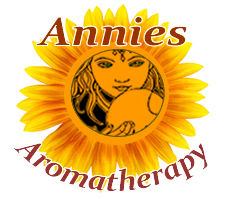 The essential oil is poisonous, and should never be ingested. Grow rue to help ward off pests from invading your garden. Distribution:Native to southern Europe, and Mediterranean countries. One of the oldest and garden plants cultivated for medicinal use introduced in England by the Romans, much used by the Ancients - regarded from the earliest times as successful in warding off contagion and the attacks of fleas and other noxious insects - one of the ingredients of the famous 'Vinegar of the Four Thieves'. The Greeks regarded it as an antimagical herb. In the Middle ages and later, it was considered a powerful defense against witches, and was used in many spells. Rue is often used in Wiccan rituals of warding off evil influences. It was also thought to bestow second sight. The common name "Herb of Grace" reflects the time when a brush of Rue was used to sprinkle the holy water in the ceremony "Asperges" before High Mass. 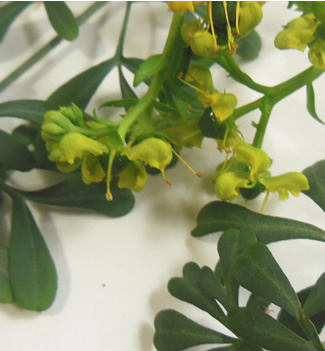 Rue was once believed to improve the eyesight and creativity, and no less personages than Michelangelo and Leonardo Da Vinci regularly ate the small, trefoil leaves to increase their own. The legend of rue lives on in playing cards, where the symbol for the suit of clubs is said to be modeled on a leaf of rue. Duke,James, Ph.D. "The Green Pharmacy Herbal Handbook"
Hoffmann, David (2010-12-15). Medical Herbalism: The Science and Practice of Herbal Medicine (p. 105). Healing Arts Press.